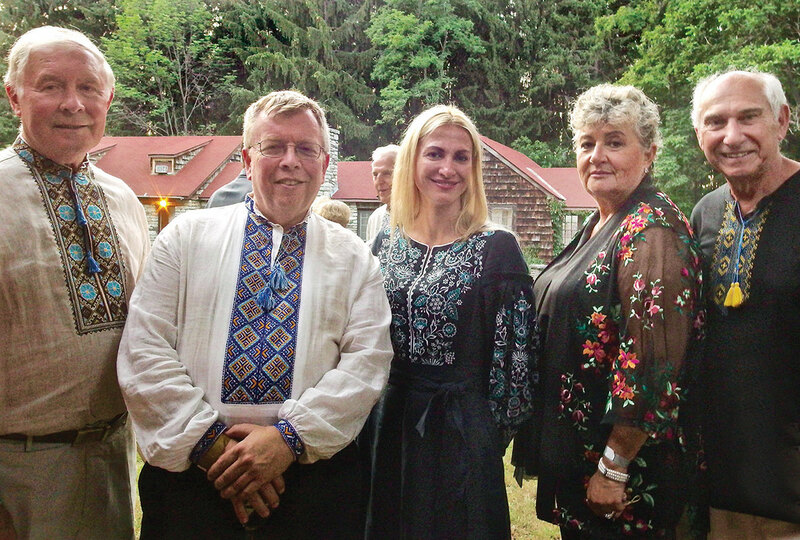 KERHONKSON, N.Y. – More than mere merrymaking, Soyuzivka’s 12th annual Ukrainian Cultural Festival was above all, a celebration of the global Ukrainian family. At the same time, this festival not only illustrated changes already in place at Soyuzivka, but also pointed to bigger transformations just around the corner for all our communities. 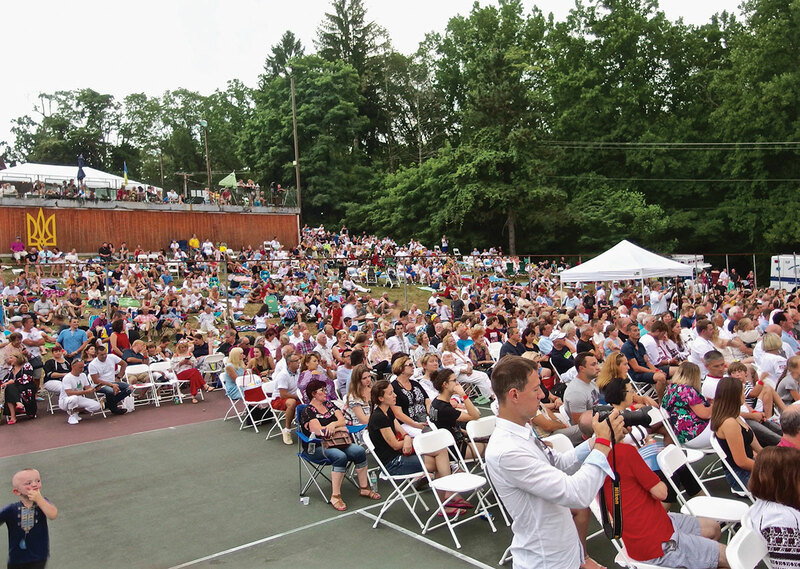 Thousands of guests from many corners of the world, young and old, flocked to the Ukrainian National Foundation’s (UNF) mountain eyrie in the airy heights of the Shawangunk Ridge on July 13-15. In addition to sharing ethnic pride, participants were united by deep concern over issues affecting all Ukrainians: their war-torn homeland, help for students and orphans, and finding ways to popularize their rich culture. When two star performers could not appear due to visa issues, the festival’s tireless artistic administrator Roma Lisovich (who is also the UNF’s treasurer) arranged to fly in fiery singer Anastasia Prykhodko. Ukrainian adaptability was further tested when a thunderstorm drenched the Saturday evening outdoor show, sending the audience scurrying for cover. Yet, the resilient fans did not go home. Many sheltered under vendor tents, singing their own songs. Eventually, the concert resumed inside the Veselka Pavilion, hosted by witty TV celebrity Petro Maha of Kyiv. On Friday evening, under a tent near the Lviv Building, an event was held that addressed the heart of the matter: questions about the future not only for Soyuzivka, but for the Ukrainian community at large. Before an audience of donors, the newly elected president of the Ukrainian National Foundation, Dr. Wasyl Szeremeta outlined the foundation’s concerns, and what its activities will mean for all of us in coming years. Meanwhile, stars from Ukraine took turns performing at this elegant dinner, superbly catered by the Soyuzivka kitchens. On this occasion, multi-talented violin virtuoso Vasyl Popadiuk took over the keyboard, improvising cocktail tunes. Garbed in uncompromising black, pop singer Ms. Prykhodko cranked up the temperature with her silky contralto voice, belting out two songs, including “Embrace the Wings,” set to her own words and music. The popular Ms. Prykhodko had represented Russia in the 2009 Eurovision Song Contest, but in 2014 she vowed never to perform in Russia again, where she still has a huge following. The first time she spoke Ukrainian was when she engaged a lady to teach her the language of her ancestors. Ms. Prykhodko appeared before the participants of the Maidan, actively supported a united Ukraine during Russian invasions and recently went on a tour for Ukrainian troops in the Donbas region. To troll Moscow, Mr. Lutiy revels in smash-mouth songs like “Kill the Muscovite Inside You,” “O Bandera, You Ukrainian Apostle,” as well as other tunes with unprintable lyrics. (Due to his political activism, Mr. Lutiy said his family life was well-nigh shattered in 2011.) A big fan of the subversive style of the earlier Hadyukin Brothers band, he believes the counter-culture will eventually succeed in Ukraine. 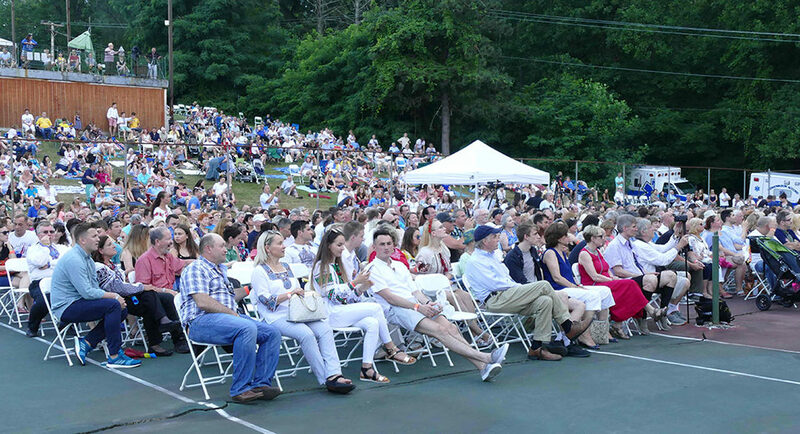 The following day on the great outdoor stage, after the presentation of colors by Ukrainian American Veterans, the Ukrainian Dumka Chorus kicked off the concert with a series of appropriately light and festive songs, including a new arrangement by conductor Vasyl Hrechynsky. 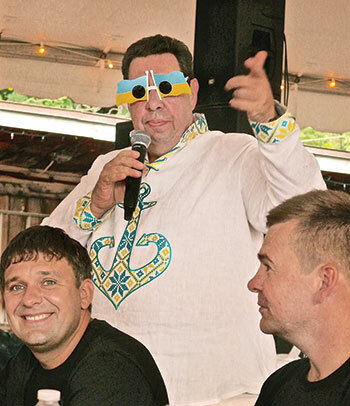 The master of ceremonies, Mr. Maha, continued to delight everyone with his witty banter, while interspersing sincere reflections on today’s problems in Ukraine. 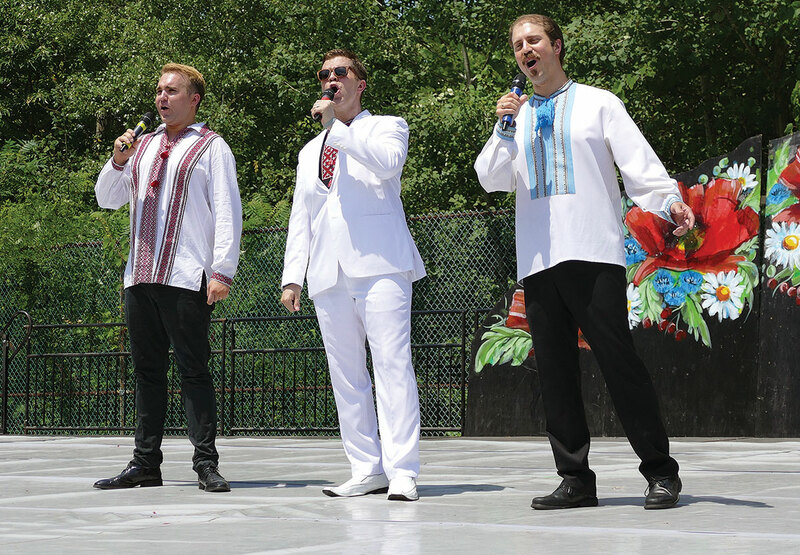 Also featured in the afternoon show were the Dobriansky Brothers vocal trio and singer Khrystyna V. The Malvy duo of Ulana and Kalyna Leshchuk beguiled listeners with their vocals and bandura playing. Vasyl Popadiuk demonstrated once again why he is a world-class jazz violin virtuoso, whether improvising on a soulful ballad, or off to the races with his lightning bow arm. Mr. Popadiuk, Mr. Maha, Andrij Dobriansky and Marianka Hawryluk constituted the quartet of masters of ceremonies for the festival weekend’s events. The Roma Pryma Bohachevsky Ukrainian Dance Workshop, under executive director Ania Lonkevych and artistic director Orlando Pagan, presented its unique brand of evocative compositions, based on folk dances and structured with the elegance of classical ballet. Particularly lovely was the composition “Melodia,” choreographed by Stefan Calka. Sunday, the final day of the festival, featured two documentary films: “Recovery Room” directed by Adriana Luhovy, which tells the story of a Canadian medical mission to Ukraine and the wounded warriors they treat; and “When we Starve,” prepared for the 85th anniversary of the genocidal famine of 1932-1933 in Ukraine, and presented by the U.S. Holodomor Committee and the Ukrainian Medical Association of North America. 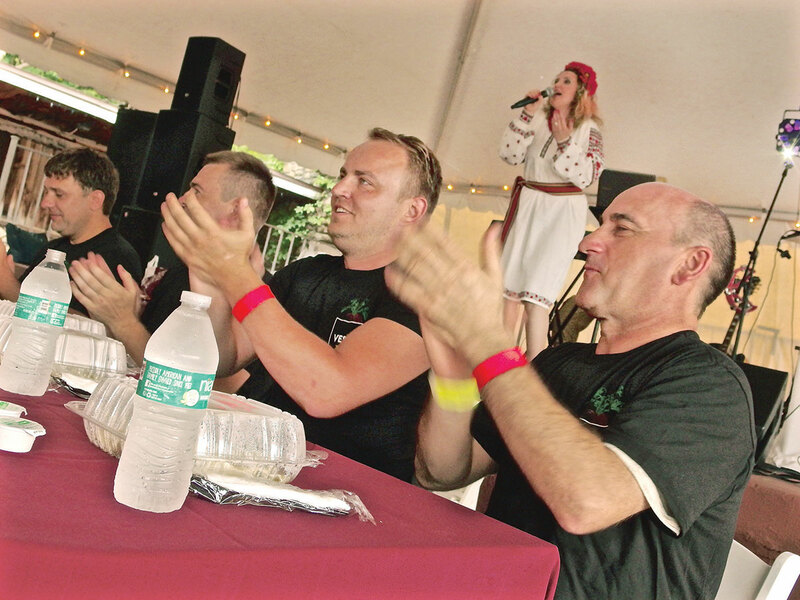 The Ukrainian Cultural Festival weekend also offered plenty of fun and good-natured silliness. The vendors’ diverse offerings drew hundreds of guests. 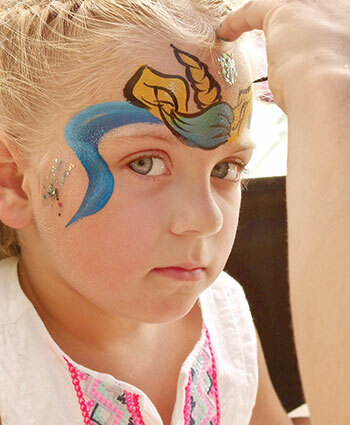 Meanwhile, near the Veselka pavilion, at the Ukrainian National Association’s information center in the gazebo, girls vied to have their faces painted by Shelly from Athena Entertainment. A blue-and-yellow unicorn design was the clear favorite amid the youngest set. There was also the recreation of a Ukrainian village, or “selo,” coordinated by Halyna Shepko that offered demonstrations of Ukrainian arts and crafts by skilled artisans. The band Brattya z Prykarpattya (Liubomyr Chermak, Bohdan Zaets and Stefan Chermak) provided live music on Saturday afternoon and during the evening. But how can anyone manage to cook hundreds of different meals daily and still serve them fresh and warm? Mr. Sonevytsky runs an efficient but happy crew under the buff lights of his subterranean galley in Main House. His assistant for 17 years, Svitlana Mycak, described all the intricate stages of prep and cooking during their sometimes 16-hour-long days. Chef Snake has catered 500 weddings at Soyuzivka and over 2,000 additional special functions, often singlehandedly. Often, he pipes in music for his workers, but always keeps a hockey stick handy for the occasional slap-shot at a rare burnt croissant (they’re made fresh in his kitchen). Anyone who visited Soyuzivka 50 years ago would now be struck by many changes. According to Ms. Lisovich, the UNF’s extensive renovation program has included: Main House ($700,000), a new water tank and reservoir ($400,000), roads ($250,000). Still needed are a new barracks for children’s camps ($300,000), renovations for the pool deck ($225,000), Uzhhorod ($180,000), Odesa ($65,000), and a steam room and spa for Poltava ($50,000). But it is not only that physical facilities have been updated. Mushrooming camp activities draw more and more participants, especially after Maidan. These include the popular Roma Pryma Bohachevsky Dance Academy, the Sitch sports camp, USCAK tennis tournaments, Plast Ukrainian Scouting Organization’s “Ptashata” day camp program, and Heritage and Discovery camps for children. 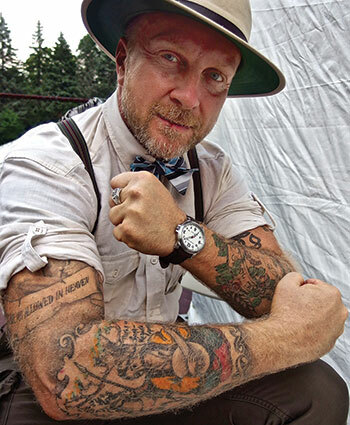 There are also wellness, alternative medicine and yoga weekends, cooking workshops by the chef, and hiking. During the “off season,” local groups such as Polish Bible camp and ballroom dancing are hosted at Soyuzivka Heritage Center. A truly heart-warming story is the attentive care devoted to adopted children at Soyuzivka. Even after they receive their new American parents, Ukrainian orphans are legally still citizens of Ukraine until they reach the age of 18. Consul Lapa manages the adoptive families program through the Consulate General of Ukraine in New York. More than merely making sure the children are safe and well-cared-for, Ms. Lapa helps arrange the annual weekend when all parents and their adoptees can meet while staying at Soyuzivka Heritage Center. Ms. Lapa explained to me the problems facing children who previously had only lived in institutional buildings: “Their new form of life within a nuclear family can be complicated for children. It is most crucial that they feel genuine love and warmth, that their identity and self-esteem are respected and reinforced.” Indeed, several loving American families have even adopted and are raising Ukrainian children born with physical handicaps. During these get-togethers at Soyuzivka, families participate in cultural programs: the adopted children are eager to learn of their heritage and history, and some of the language. They enjoy trying folk dances, singing songs, hearing the bandura, and creating their own vases or pysanky. Children who have attended several of these annual events look forward to seeing their friends from previous years. Many become soul-mates and buddies for life. 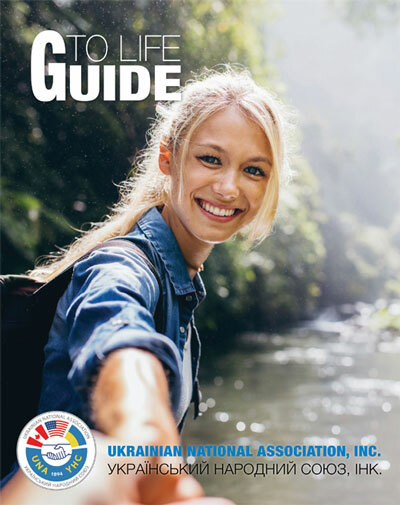 Volunteer Bohdana Puzyk, who is an advisor on the Ukrainian National Association’s General Assembly, has been Soyuzivka’s liaison with the U.S. State Department, coordinating Ukrainian students who arrive for summers on Work and Travel permits. About 20 students annually are admitted via this program. Each is responsible for registration costs and airfare, but after a summer’s work, students can pay off those fees and still have enough left to finance one year of college education back in Ukraine. Third-generation Ukrainian, lifeguard Patrick Monks resides with the Ukrainian students, and told me many speak four or five languages and are very hard-working. During their free time, students travel to sightsee America. Worker success stories include a local Ukrainian girl who married a boy from Dnipro; both are now successfully employed on the West Coast. Others have also made arrangements to remain behind legally, in order to study for careers in medicine and photography. There’s festivals… and then there’s festivals. To underscore this point, I’d like to add a bit of historical lore. Just under 30 miles via County Road 3 from Soyuzivka lies Woodstock, site of the “legendary” 1969 mega-event that hosted a six-months-pregnant Joan Baez, a rain-drenched Ravi Shankar and a wacked-out Jimmy Hendrix, just one pluck away from exploding his psychedelic guitar, spazzing his way through the national anthem. For thousands of Woodstock’s attendees it became a massive, teeming, squalid nightmare: traffic jams, reeking portable johns, scorched eyeballs and tons of resulting garbage. But, as we’ve been told, it was peace, love, music – that sort of thing. Yet even now, people are still wondering just what the heck was all that fuss about? By contrast, in coming years the annual Ukrainian Cultural Festival and Soyuzivka itself have the potential to evolve beyond a unifying hub for North American communities and emerge as a vibrant cultural and heritage center for all Ukrainians. That is, provided everyone gets behind it and supports the UNF. If we succeed – wow! That’ll be just outtasight!… Peace.